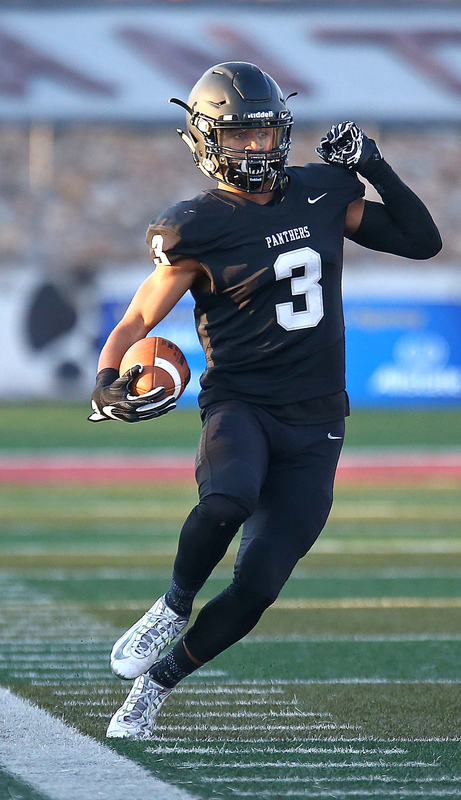 CEDAR CITY – The Pine View Panthers ground out a 17-3 win over the Cedar Redmen Wednesday night behind quarterback Dallin Brown and star running back Jacob Mpungi. The Panthers were looking to strike early after the Redmen muffed a punt at their own 30-yard line with 7:21 left in the first quarter. Brown and Mpungi accounted for the next 36 yards, but a holding penalty and a fumble gave the ball back to the Redmen at their own 1-yard line with 3:57 left in the quarter. The Redmen were forced to punt the ball to Pine View speedster Michael Moten, who took the ball from the Redmen 38-yard line all the way to the 8-yard line. Mpungi punched the ball into the end zone on the next play to give the Panthers a 7-0 lead with 1:32 left in the first quarter. Moten, however, put the glory on his running back. The Redmen tried all night to get Trenton Mauer into a groove. After rushing for more than 200 yards last week against Snow Canyon, Mauer finished the first half with only one run that went over 2 yards. At the start of the second quarter, the Panthers went to Brown on four consecutive plays. On the fourth play, Brown fumbled the ball once again. The Redmen were able to recover the ball at their own 25-yard line. Quarterback Jaxon Garrett complete a pass to Luke Maggio on the next play for a gain of 21 yards down to the 46-yard line. The Redmen would stall for three plays and punted the ball back to the Panthers. However, Moten muffed the punt and Cedar recovered the ball at the Panthers 15-yard line. The Redmen were only able to get 10 yards on the next eight plays, and were forced to kick a 22-yard field goal that cut the Panthers lead to 7-3. Moten took the ensuing kickoff 27 yards to put the Panthers in good field position. Brown and Mpungi would then carry the Panthers offense down the field once again. Moten caught a pass from Brown later on and weaved his way through the defense for a 48-yard gain to the Redmen’s 14-yard line. Brown ran the ball into the end zone on the next play, but a holding penalty took the points off the board and the offense back to the 25-yard line. Mpungi ran the ball to the 7-yard line on the next play, but a false start penalty took that play away as well. Eventually, the Panthers were forced to kick a 32-yard field goal. The kick failed, keeping the score at 7-3 in favor of the Panthers with 1:03 left in the half. The Redmen made an attempt to get downfield, but could not put enough yards together on the first two plays. Pine View almost picked off a pass, but it fell just out of Christian Ries’ reach. The half ended with Mauer getting a 9-yard rush. With 6:45 left in the third quarter, Pine View took possession after forcing the Redmen into a three-and-out. A holding penalty forced Pine View into a second-and-18 from their own 16-yard line. Mpungi got the ball and ran out to the 42-yard line for a 26-yard gain. Mpungi then ran to the Redmen 37-yard line for a 17-yard gain. In all, he finished with 18 carries for 114 yards and one touchdown. The Panthers then went to Brown on four straight plays again. Brown got the final 37 yards, finishing the drive off with a 10-yard touchdown run with 3:19 left in the third quarter. Brown finished the game with 26 carries for 111 yards, as well as going 6 for 6 for 88 yards in the passing game. Neither team could get anything going until late in the fourth quarter. After the Panthers hit a 23-yard field goal to extend the lead to 17-3, the Redmen took possession with six minutes to go, looking for a way to get back into the game. Cedar moved the ball down to the Pine View 38-yard line after an interception was called back for a defensive holding. Garrett found Maggio again for a 15 yard gain to the Panthers 23-yard line, putting the Redmen in striking distance. With 2:09 left in the game, Garrett dropped back to pass and threw the ball deep to Tayvien Brown. But the pass was overthrown, and the ball landed in the hands of Mpungi, who was playing cornerback. The interception ended all hope of the Redmen coming back, as they only had one timeout left. The Panthers ran out the rest of the clock, securing the road win. 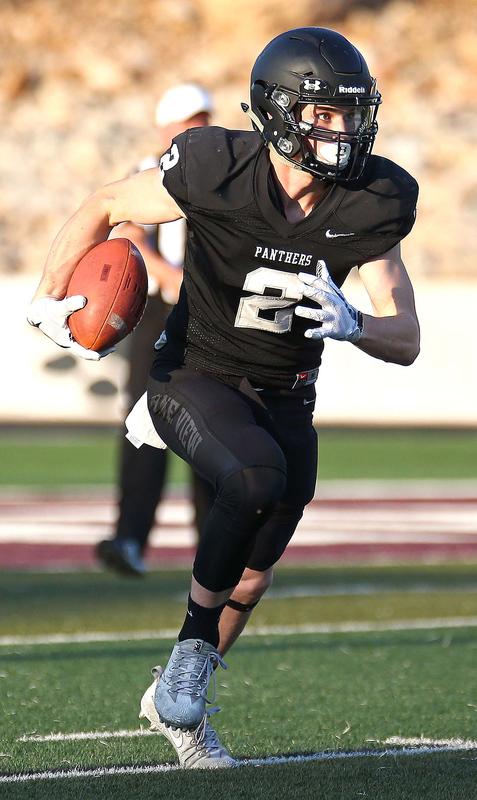 With the Panthers win, four teams are now tied for second place in Region 9 with 3-2 records. The Panthers will host Canyon View on Oct. 20 to close out the season, with a win securing them a spot in the playoffs. A loss will result in a tiebreaker. Cedar will host Dixie on Oct. 19, with a win securing a playoff spot, while a loss puts the postseason in jeopardy. The winner of Snow Canyon and Desert Hills will get the playoff spot secured, while the loser will have to hope to win a tiebreaker (or play-in game), if the need arises.